In Europe there has, without a doubt, never been such a broad consensus on the need to transform agriculture and change our eating habits. However, there is very strong resistance to change from the agribusiness model. How do you explain this paradoxical situation? There is a wide gap between European citizens and policy-makers. Even though the Commission, the Member States, and the vast majority of the Parliament are largely conservative when it comes to agriculture, all of the opinion polls suggest that consumers feel quite the opposite. More than 75% of people reject GMOs and the majority prefer local food supply chains, high-quality products, agriculture that is respectful of the environment, and support for small and medium-sized farms. The majority of consumer and environmental organisations share this sentiment. In July 2009 a meeting organised by the European Agricultural Commissioner resulted in a broad consensus that the direction of agriculture should be changed. The Commissioner also used this meeting as an occasion to propose a transformation of the CAP. However, the conservatives committed to the agribusiness model continue to dominate the Commission. The agribusiness model is also defended by large retailers and organisations of industrial producers such as COPA-COGECA. And the Member States take the same stance also. Their reasoning for this is solely based on market shares; not at all on land development, the preservation of farmers, or listening to consumers’ demands. They are completely out of step with public opinion. They neither understand how to act nor respond when faced with health or food crises. Today, for example, they are trying to get permission from the EU to introduce GMOs into the supply chain or allow the sale of cloned meat at a European level. This would be catastrophic. What are the most important points in the debate surrounding the future of the CAP? There are four key points. Firstly, the CAP has to be legitimate. We have to put our money in the right hands. Will we be able to reduce wastage from the distribution of direct aid? The Greens want to cap subsidies at €100,000 per farm. This would only affect 3 in 4000 farms out of a total of 12 million in the EU. However, the Council and the conservatives within the European Parliament refuse to accept this, as illustrated recently by the European Parliament’s position adopted on 13 March 2013. Our second test: will we be able to distribute the aid equally to small farmers and continue to support farms whose total amount of land makes up less than the national average? The third, very important point, is the idea of “greening”. The CAP should combat global warming, the deterioration of soil and water, and the weakening of biodiversity. It should also reduce the agricultural trade deficit within the EU. The measure proposed by the Greens is a crop rotation to: encourage the predominance of vegetable proteins which fix nitrogen from the air, use fewer fertilisers and pesticides, and reduce soya imports from North and South America. Unfortunately, most of these forward-looking elements – and the crop rotation measure in particular – have been rejected by the European Parliament, under the influence of a conservative majority. Today, as the Doha Round is at an impasse, the EU has signed a number of free trade agreements with countries or groups of countries. This always has devastating consequences for farmers. Would it not be both logical and common sense to make savings in the CAP budget which still accounts for almost 40% of the European budget? The scandal is not that the CAP makes up 40% of the budget of the EU; it is that the budget of the EU only represents 1% of European GDP! The CAP budget accounts for less than 0.5% of the GDP in the EU. For a policy that remains essential for our future, this is a ridiculous amount when you compare it with the likes of the US or Brazil. However, the Council’s proposal would imply an 11% reduction of the budget. The first pillar which accounts for 80% of funds and finances direct aid would be affected less than the second pillar where necessary cuts would have to be made. However, the latter is responsible for financing the entire rural development and land support policy, as well as all incentives associated with “greening”. In other words, the agribusiness lobby will have succeeded . Should the Greens not be making more of an issue of this? The Greens have always been the first to denounce health scandals. In France, I called for a boycott of farmed fish which were not labelled as being “meat-and-bone meal free”. But perhaps we need something spectacular. A political movement cannot gain legitimacy without taking risks. In any case, when it comes to voting on the budget, increased pressure must be exerted on the MEPs, particularly online. When faced with the current crisis, are issues surrounding the quality of food really still on the agenda? Certain people, such as the German Minister for Development Dirk Niebel, are calling for ready-made meals containing horse meat to be given to the poor. It is the very same people who are making such shameful demands that are also opposed to informing people about what is in the food they are eating. Who decides to reduce the aid given to the most vulnerable of our society by more than a billion? The Council! Today, one of the main challenges in giving aid to the most vulnerable of our society, is not only to increase the volume, but also to shorten the supply chains so that support comes from their closest producers. In France, networks have already been established between solidarity food stores and farmers in difficulty who receive both an outlet for their produce and guaranteed remuneration; a portion of the CAP subsidies could go towards this. Faced with resistance from the conservatives active at a European level, have you never thought about quitting the world of institutional politics and focusing more on civil society issues? The thought never really crosses my mind! I have been a farmer for 35 years. As a trade unionist, I fought hard to raise local awareness of global issues such as junk food. My decision to be at the European Parliament was also guided by my desire to serve as the link between civil society and the institutions. 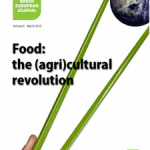 Is the relationship between the Greens and farmers in the process of changing? In Belgium, Ecolo’s response at the time of the dairy crisis was clearly very well received by farmers. And as a former trade unionist for the agricultural sector, I contributed towards political movements which have had consequences. For the Greens it is crucial not to be perceived as people coming from the city any telling the farmers what they have to do. Are the agricultural proposals put forward by the Greens not sometimes a little unrealistic for the farming world? You have to be very careful. The proposals put forward by the Greens should not be consumer or environmentalist proposals. They should be proposals for a comprehensive food model which incorporates the very first people to be affected – the farmers. An agricultural project without farmers would be impossible. The first thing we need to do is get away from the CAP framework and redefine its objectives. After that, we need to use the tools available to us on a national and regional level; things such as local abattoirs, institutional catering, and agricultural schools for young people, so that they do not reproduce the old model. We also need to change the land legislation to allow access to land and to prevent its “artificialisation”. It is a gradual process that will take at least 10 or 15 years. The Commission has made already its first concession by allowing cattle carcasses treated with lactic acid to enter the EU. Tomorrow, it will be chlorine to clean chicken carcasses and who knows what else. What is your view of the challenges for the free trade negotiations with the US? From 1986 to 1995, the Uruguay Round brought agriculture into international trade negotiations. This gave rise to three reforms of the CAP in 1992, 1999 and 2003, with dire consequences for European farmers. The internal market prices were aligned with those of the global market. The subsidies for products turned into subsidies per hectare. Afterwards, the CAP budget could no longer be funded by trade tariffs (which accounted for 70-75% of its funds). Today, as the Doha Round is at an impasse, the EU has signed a number of free trade agreements with countries or groups of countries. This always has devastating consequences for farmers. The free trade agreement with Morocco, which has allowed for an increase of export quotas for Moroccan tomatoes, does not benefit small Moroccan farmers, but rather three companies: “Les Domaines Agricoles” which belongs to the King of Morocco, and the two companies Idyl and AZURA which are based in France. In exchange, Moroccan farmers have to endure their market being opened for cereals, meat and dairy products. Furthermore, a portion of these tomatoes are produced by pumping from deep non-renewable water tables which are located in Western Sahara. What’s more, the risk is so great that discussions relating to a free trade agreement between Europe and the US are exerting intense pressure on European agricultural standards, whether these relate to GMOs, pesticides, patents, or health standards. The Commission has made already its first concession by allowing cattle carcasses treated with lactic acid to enter the EU. Tomorrow, it will be chlorine to clean chicken carcasses and who knows what else. We know that we must question free trade mechanisms if we want to successfully re-localise production and pave the way towards a form of food sovereignty. But is this really possible? I find that the free trade model for agriculture and food regularly reveals its own flaws. Effects of global warming such as the pressure on food prices, particularly for countries in the South, will sooner or later pose a real problem. Furthermore, many large countries such as China, India and Indonesia do not ask questions and want to preserve their agriculture. They all have a stake in it. An agricultural and food crisis therefore lies ahead of us. The pressure is going to become stronger and stronger. But there will come a time when things start to regulate themselves, at least if European citizens lobby for a re-localisation of production. If we continue to fight for food sovereignty, local trade, and local supply chains, whether this is for the environment, food, or society, this will move us in the right direction. Is this challenge not fundamentally a cultural one? Should we not be doing everything we can to support food as a cultural phenomenon? On a political level, we defend the idea that European culture is a common ideal shared by all Europeans. But we accredit this culture to arts such as music, literature or cinema, and cuisine is overlooked. Yet for me, this was the very first expression of culture, even before the birth of literature. Long before people even began painting on cave walls, the ways in which people ate and started to cook food gave rise to a culture of taste which has developed ever since. Today, this culture represents a phenomenal wealth of different cuisines. Europe has the greatest culinary diversity in the world. But this part of our culture is not as valued as it should be. There are, of course, networks of activists such as “slowfood” and others, but it is important that citizens now reclaim this culture. We need to dispel the idea that food solely serves the purpose of satisfying a biological need. One thing that is essential when it comes to food, aside from the cultural aspect that I have already mentioned, is being able to enjoy it with others. Mealtimes are where relationships are forged; a time for us to come together. And this is the same in almost every country. The problem nowadays is that people accept junk food as part of their daily diet, but are still happy to “splash out” for special occasions. In the US, for example, the most important celebration is not Independence Day but Thanksgiving. Americans celebrate this day – a day on which the first settlers struggled to survive without food and were taught how to grow their own food by Indians – by cooking a feast. It is very surprising to see a country such as the US which we view as being so different from our culture, dedicating a day of celebration to the enjoyment of food. Can you imagine there being a European day to celebrate food? I’m not sure that it would work by creating such a day on artificial premises. On the other hand, I believe that making a real effort to develop the cultural and political aspects is important. A number of initiatives already exist but perhaps we need to combine these on a European level. It is clear that there are very strong cultural differences within the EU today. These differences also shine through in the European Parliament when it comes to debate surrounding the issue of food; people look at you in astonishment when you defend good food. Funnily enough, they are not the same people who dine in restaurants. But they disassociate the biological need from the festive, social and cultural aspects of food. I believe that we have to reunite these two dimensions.